As the weather turns cold, I seem to turn to textiles as my preferred art form. Pictured above and below, a recent construction. 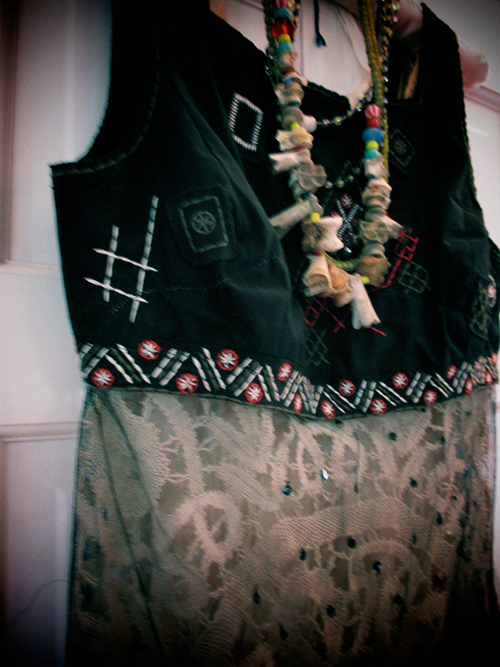 The beautifully embroidered top was found as-is, been trying to find a way to work with it for YEARS. Ancient tattered and be-sequined black tulle/lace affixed. 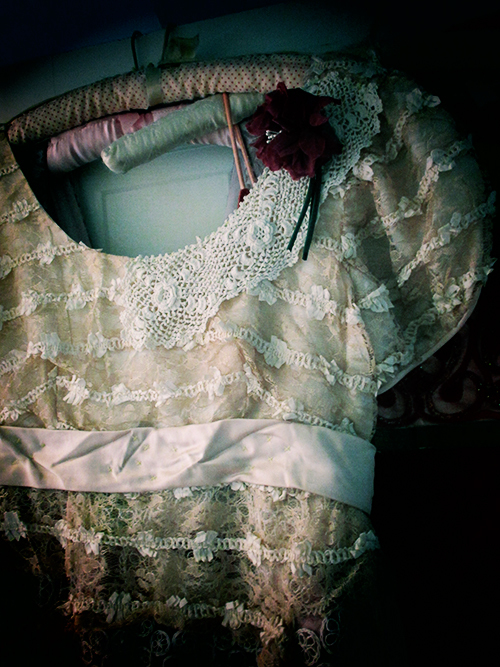 Worn as an apron (ties in back) over a very vintage cream slip. I love the way my bones necklace looks with it and will probably wear this all together. 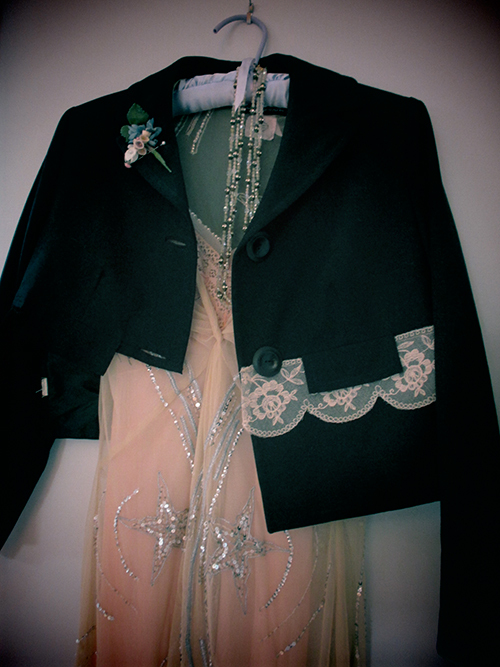 Made this a little while ago, a fairly simple deconstruction of a thrifted vintage black wool jacket, with some very pretty very old lace. 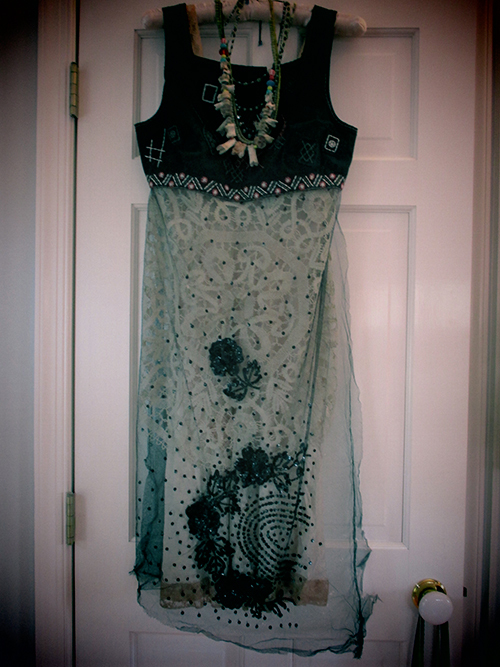 Beneath it is an Antik Batik dress purchased at a consignment shop in the Marais Distric, Paris. Most divine thing ever. Another decon jacket with children’s scissors affixed. 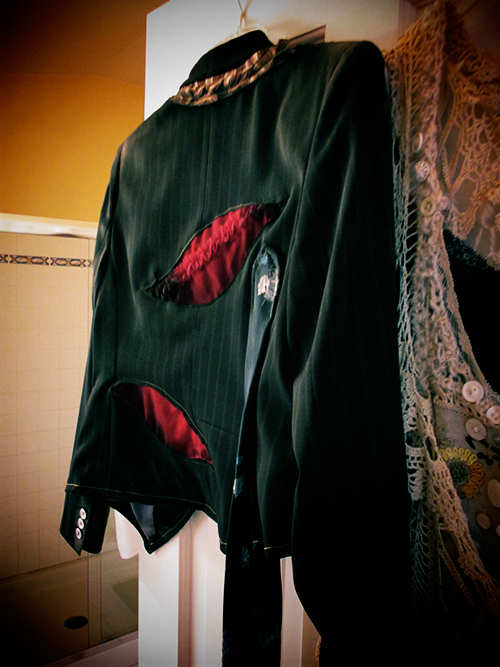 Has weird red velvet reverse patches and several men’s ties, one of which hangs down like a long strap from the bottom. For some reason, I’m always narrowing the sleeves down to being very skinny and fitted. The back has more of the strange and surreal shapes. I think this one is sort of Schiaparelli inspired. Another (and very moody!) 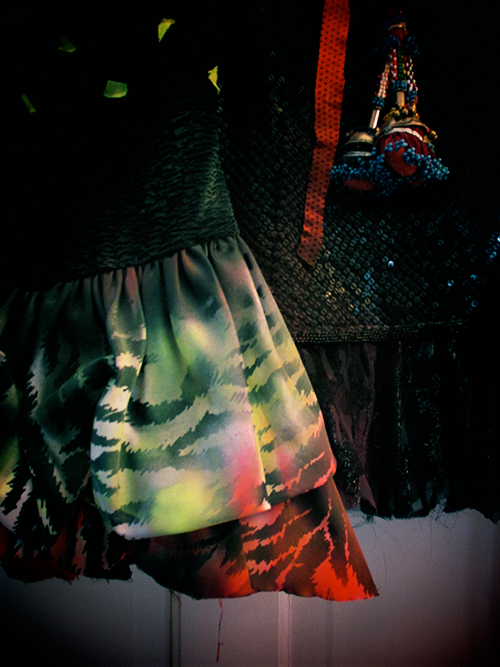 shot of two pieces from last year… very tribal 80’s fusion, with neon and animal print and vintage Afghani jewelry for sytling. I shall leave you with this, a dress you may have seen many times, The Broken Teacup. I still delight in this piece and am always amazed to see it linked and pinned all over the Internet. You can visit all of these photos in larger sizes over on my flickr. 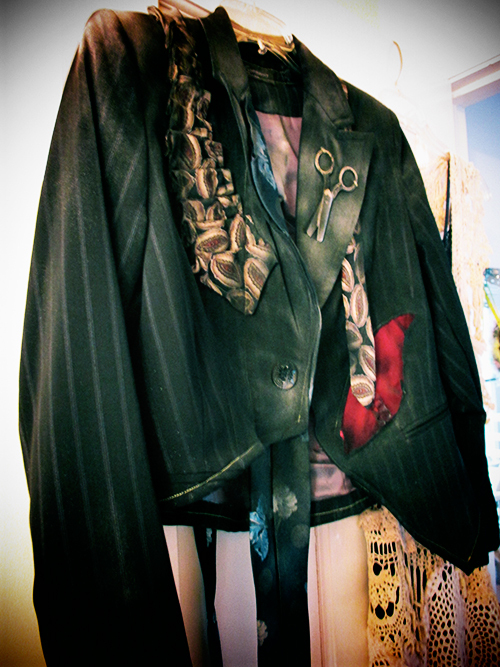 And now… back to sewing, dears! verrrrrrry niiiiiiiiice. i especially love the corsages and the scissors! Hello! Do you have a Ewa i Walla coat? In a size S? No, I do not sell Ewa i Walla clothing.